October is here and it is Breast Cancer Awareness month. Every year, I post a pink manicure in support of this campaign. So I am taking a short break from my 2014 Halloween series to share with you a nail art for Breast Cancer Awareness inspired by the color pink, the official color of this project. This nail design is nothing new. It is a recreation of my Blue Waves I did on 2012 and just changed the color theme. I have been meaning to redo this design and finally found the perfect time to do so. This health advocacy was established to spread awareness through proper education and knowledge regarding breast cancer. It is with hope that this will lead people to know the symptoms for early detection. It also aims to reduce the negative effects it may cause patients. As a woman, I am particularly drawn to this campaign and I hope that more people will be too. I also hope that this nail art can somehow help in spreading the word on Breast Cancer Awareness. I am still not fond of wearing pink, but this worthy cause is reason for an exception. 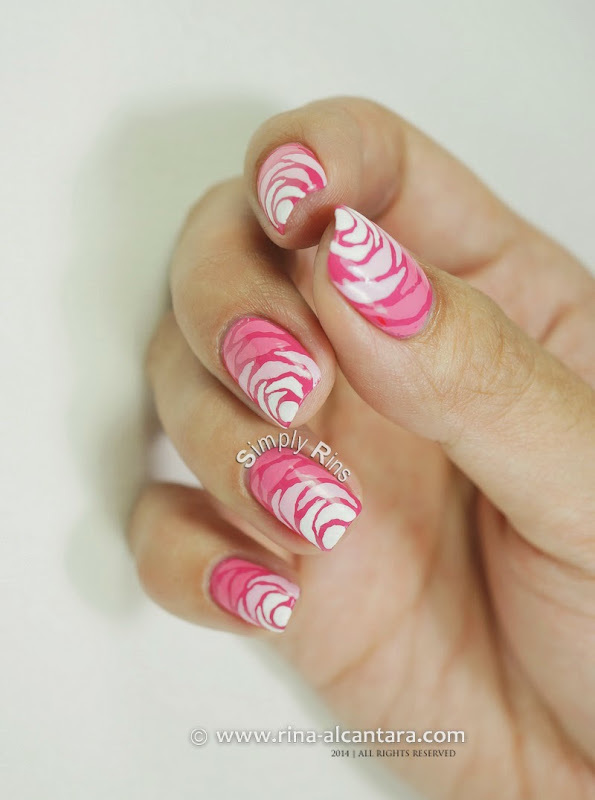 I decided on a pink gradient or ombre manicure that somehow resembles a rose. Well, sort of if you look at the nail art from a distance. However I (or you) see this, I don't think I'll ever get tired of recreating this nail design. I'm looking forward to to more color combinations. Perhaps not an monochromatic next time. This is a freehand nail art and I used a detail nail art brush and Liquitex Basics acrylic paints. If you're wondering where I painted the pink ribbon, I did so on my thumb (refer to photo below). It is my first time to use my thumb for an accent nail because I figured it would be hard to photograph. Well, it still is difficult to picture. But I still gave it a go for a change. This is absolutely a dainty mani and I seriously love the outcome. Even though it is all about pink, I find it very wearable and really attractive to wear. 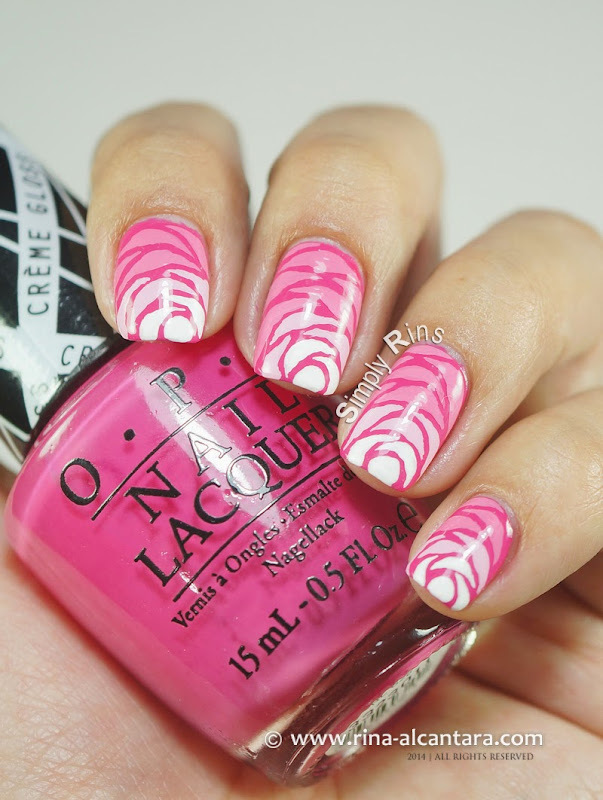 I'd like to close this post by saying (again) that this is a nail art in support of Breast Cancer Awareness campaign. I am sure that a lot of nail bloggers out there would be sharing their pink manicures this month and I am looking forward to seeing them. This may be a small way to help spread awareness, but I guess what matters most is that we try to play our part to help. Let me know what you think. Did you like this nail design? Hi, Rins...it's too bad you don't like pink because it clearly likes you...the blue-based pinks in this mani are very flattering on you! It's also great to see a breast cancer awareness mani. My aunt beat breast cancer a few decades ago, but it took a mastectomy to do it. Hope you and Floozie are enjoying your day!